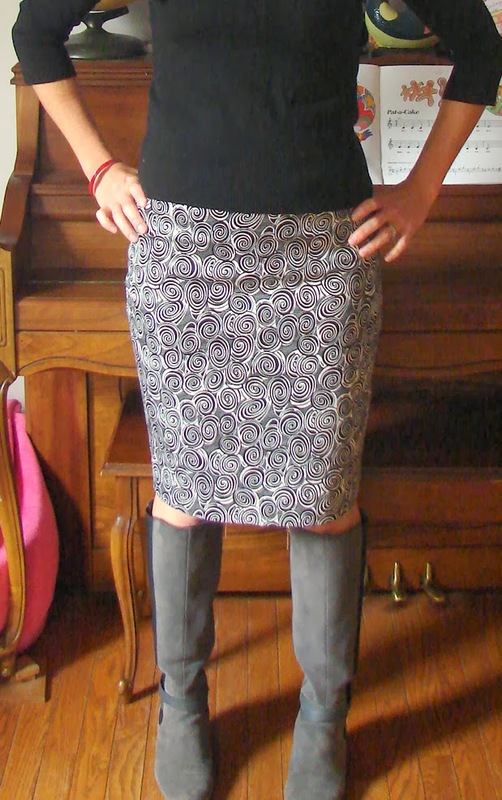 Sometime back in the summer I agreed to be a pattern test for Studio Faro's Pencil Skirt Worksheet. I finished my muslin in late August or September, but then the wedding dress took over. All along I planned to make up the skirt using this fabric, and when I saw that the challenge this week on Project Sewn was for a graphic print, I knew I had to get busy. I like having bold prints or bright colors on my lower half as it provides a balance for my broad shoulders. This fabric is a stretch cotton sateen from GorgeousFabrics.com, and it's on sale this weekend! Underlined the waistband with flannel and organza and added spiral steel boning. I also drafted the skirt with a 2-inch contoured waistband, because I like it like that. Installed a waist stay to keep the skirt in place (I walk fast and my side seam often ends up a center front). Put drapery weights in the back vent to keep the corners from flipping up (I like how the weights tap the back of my knees when I walk) and finished the hem with lace and a blind stitch. Installed the zipper by hand with a pick stitch so that I could better match across the seam. I used one of my favorite buttons from my button collection. I found this at a thrift store where it was the only one of it's kind - perfect for a skirt! Isn't it a beauty? I tweaked the fit a bit between the muslin and this skirt by taking in the side seams a titch, as my muslin was made with, well, MUSLIN, and my fashion fabric was a stretch cotton sateen. I'm really amazed how well this came off the drafting table! I should have some finished wedding dress photos to show you soon and I plan to write a "what I learned" post about the whole experience. Next up: Gertie's wiggle dress for a client! 16 comments on "Graphic Studio Faro Pencil Skirt"
Those are some fantastic details! Perfect fit on this skirt! Thanks, Gail! I'm in love with waist stays now - I'm thinking about adding them to everything in my closet! Great skirt! I love the fabric. It fits you perfectly! Thanks for the great worksheet, Anita! Great skirt, love the print! Lookd great paired with those boots too! Thanks, Margo - I love your project sewn dress! And these are my favorite boots - I spent most of last winter tracking down the gray boots I had in my head, so this winter I actually get to wear them! Thanks for the invite, Lauren! What an awesome skirt. The finishing looks impeccable! Beautiful use of the fabric design. It fits you beautifully. What a great skirt! The fit is perfect!!! I'm a bit late to comment, but love the skirt. I have the same issue (my seams always travel around when wearing skirts) and I've never thought of putting in a waist stay. I've just learned something new :) Thanks!